Usually when we make a salad we just use whatever we have in the fridge. And today is no exception; A classic BLT sandwich turned salad. Delish! Brown bacon until done. Drain on paper towel. Cut into pieces and set aside. Wash all veggies well (make sure you dry the lettuce when finished). Peel and slice 1/2 of a cucumber, set aside. Next peel and roughly chop hard boiled eggs. Add salad to a large bowl. 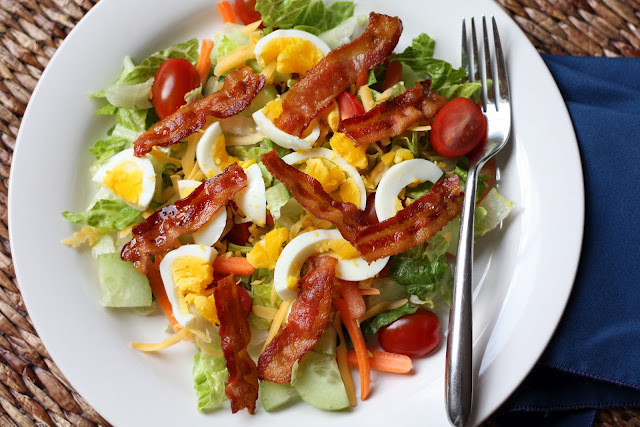 Top salad with bacon, tomatoes, cucumber, cheese and eggs. Serve with your favorite dressing. Posted on August 1, 2012, in Lady Fab Cooks and tagged dinner, food, recipe, salad, the porter house grille. Bookmark the permalink. 1 Comment. I just want to say I am newbie to blogging and site-building and truly savored this web site. Probably I’m planning to bookmark your blog . You absolutely come with amazing articles and reviews. Many thanks for revealing your website page.